Sometimes the truth shows up where you least expect it. Forty-eight hours before the Louis Farrakhan-led march of African Americans through the streets of Washington, D.C., the controversial minister Thursday repeated his charge that levees in New Orleans were intentionally blown up on Aug. 29, following Hurricane Katrina. He also implied that the Bush administration may have orchestrated the Sept. 11, 2001, terrorist attacks on the U.S.
Can someone explain to me what the statement in bold means? The city scientist who led the effort to identify 9/11 victims said officials made sure to keep the remains of the three terrorists identified away from those of the innocents killed. The remains of the killers were removed from the medical examiner's makeshift memorial park on the East Side and "put in another place," Robert Shaler, former head of the medical examiner's forensic unit, told the Daily News. There have been a few new 9/11 related DVDs that have come out. I wanted to mention them as they come out so that those interested are aware, and to hopefully provide some sales for those working hard to create new methods of spreading 9/11 news. 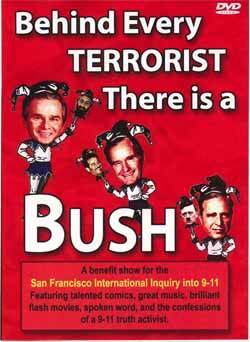 Behind Every Terrorist - There is a Bush was a benefit show for the San Francisco International Inquiry into 9-11. It featured talented comics, great music, brilliant flash movies, spoken word, and the confessions of a 9-11 truth activist. Just got an email from thoughtpolicy.com stating that they are going out of business. 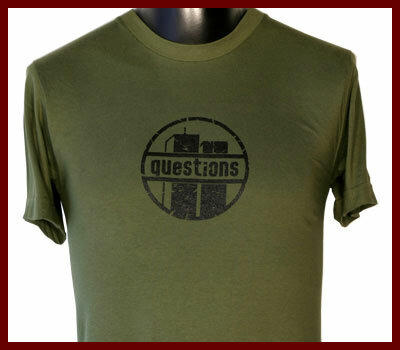 They offer a bunch of different shirts including the 9/11 related shirt shown below. They are offering 50% off of all of their merchandise, so if you haven't checked them out now would be a good time. The preface of veteran Middle East CIA agent Robert Baer's 2002 book See No Evil ends on an astonishing note: "The other day a reporter friend told me that one of the highest-ranking CIA officials had said to him, off the record, that when the dust finally clears, Americans will see that September 11 was a triumph for the intelligence community, not a failure." 9/11 an intelligence triumph? If the horrific, nationally televised mass murder of almost 3,000 Americans, the destruction of our most prominent architectural monument, the successful attack on our nation's top military command center, the controlled demolition of our Constitution, and the initiation of a series of military quagmires that are destroying our economy and hence our world primacy was an â€œintelligence triumph,â€ maybe we need more intelligence failures. Patrick Fitzgerald, will you please give Baer's journalist friend the Judith Miller treatment so we can learn the identity of this top-ranking CIA official who considers 9/11 an intelligence triumph? Perhaps he could be persuaded to kindly explain to your grand jury exactly what he meant. The disastrous 9/11 attack took place a long time ago, yet its essential elements are still being debated on the Internet. While the disputes themselves and the supporting evidence make for disturbing reading, their existence continues to illustrate the gulf between a sizeable minority of American citizenry and the government of the country in which it must put its trust if civil society is to prosper. What is just as disturbing - or even moreso - is the quantity and quality of the evidence that continues to turn up. Much of it would seem to indicate that indeed there are puzzling discrepancies between what is commonly understood to be the case about 9/11 and what actually occurred. My argument is as straightforward as it is secure and convincing: Our government was behind the terror attacks of 9-11. To be believed, the argument requires that one think adult thoughts, have a more than casually informed view of history, and be willing to distinguish a fact from a sweet, soothing fiction. We are told that on 9-11, 2001, we were attacked by a band of terrorist prodigies. 19 fanatical Arab wunderkinds of terror. They eluded our vast intelligence network and somehow managed to take out the Twin Towers and the Pentagon.